This beautiful Lemon Tart consists of a buttery shortbread crust, a creamy smooth lemon filling made with fresh lemon juice, sugar, and cream cheese, all covered with lovely swirls of whipped cream. Now, if you serve this tart the day it is made the tart's crust will be nice and crisp and you will taste the full tanginess of the lemon filling. Delicious. But if you store the tart in the refrigerator overnight, the shortbread crust will soften a little and the flavor of the lemon filling will mellow slightly, so all the textures and flavors of the tart seem to blend together. Again, delicious. To make this Lemon Tart we start with a shortbread crust. Most of us think of shortbread as a cookie, but it also makes a great crust that is very easy to put together. Just place the flour, sugar, salt, and cold butter in your food processor and give them a quick whirl until you see a dough beginning to form. Then simply press the dough into your tart pan, prick the bottom of the pastry, and place the pan in the freezer for about 15 minutes. Although we are going to pre bake the shortbread crust, there is no need to line the pastry crust with parchment paper, and fill it with pie weights to prevent the pastry from puffing up during baking. This step is eliminated when you freeze the tart shell before baking. Once the crust is baked, next comes the lemon filling. What I like about this filling is that it does not use exotic ingredients and its main ingredient, lemons, are available year round, at a good price, with consistently good quality. 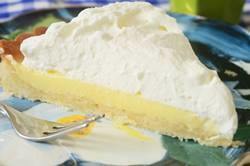 But besides using the lemon's juice and its zest, this lemon filling contains cream cheese. Unusual, yes, but it gives this filling a creamy texture that you could describe as almost cheesecake-like. Don't worry, though, this filling still has that wonderful tart lemony flavor that we all love. Again, as with the shortbread crust, all that is needed is a quick whirl of the ingredients in your food processor. The filling is then poured into the pre baked tart shell and baked until the filling is just set. Now, you will notice that I have topped the Lemon Tart with a layer of whipped cream. This is done both to temper the tartness of the lemon filling and to give a nice presentation, especially if you take the time to pipe the cream with a decorative star tip. Shortbread Crust: Butter or lightly spray with a nonstick vegetable cooking spray, an 8 - 9 inch (20 - 23 cm) tart pan with a removable bottom. Preheat oven to 425 degrees F (220 degrees C) and place rack in center of oven. When the pastry is completely chilled, place the tart pan on a larger baking sheet and bake until the crust is golden brown, about 13 - 15 minutes. Remove from oven and place on a wire rack to cool while you make the filling. Reduce the oven temperature to 350 degrees (177 degrees C). Lemon Filling: In a food processor or electric mixer, place the cream cheese and process until smooth. Add sugar and process until incorporated. Add the eggs and process until thoroughly combined. Add the lemon juice and zest and process until well blended and smooth. Pour filling into pre baked tart shell and bake for approximately 25 - 30 minutes or until filling is set. Transfer tart to a wire rack to cool and then cover and refrigerate until well chilled, at least an hour. Topping: Put your mixing bowl and whisk in the freezer for about 15 minutes. Then beat the whipping cream and powdered sugar until stiff peaks form. Can just spread the whipped cream over the filling or transfer the whipped cream to a pastry bag fitted with star tip (#1M), and pipe stars over the entire surface of the tart. Refrigerate until serving time. Serves 6 - 8 people. 5 ounces (140 grams) cream cheese, room temperature. Always remove the zest first before halving and squeezing the lemon. Use a fine strainer to remove the seeds and pulp from the juice.